ROSWELL, Ga. -- A second person died after a 68-year-old woman struck three pedestrians at a bus stop in Roswell Thursday afternoon. Police confirmed Friday that a female victim died at North Fulton hospital. She was identified as 41-year-old Larsharon Clark. ROSWELL, GA (WXIA) – One person was killed and two others hurt after a car driven by a 68-year-old woman struck three pedestrians at a bus stop in Roswell Thursday afternoon. The car swerved to avoid hitting a bus, striking the three pedestrians at the intersection of Alpharetta Highway at Fraser Street and then hit a utility pole. "Apparently the bus had just stopped and they were about to pick up the passengers and for some reason unknown yet, she was about to hit the rear of that bus and swerved to avoid the collision," Officer Lisa Holland said. The two surviving pedestrians have been taken to a local hospital, their condition is not presently known. The Fulton County Medical Examiner’s office said the man killed was 55-year-old Curtis Freeman of Roswell. ROSWELL — Police have made an arrest after four people were injured by gunfire Sunday morning after a disagreement that started in a Roswell hookah bar continued outside. Authorities charged 39-year-old Jacob Weaver with seven counts of Aggravated Assault and one count of Armed Robbery. According to Roswell Police Spokeswoman Lisa Holland, a fight broke out at the Moon Hookah Bar and Restaurant on Atlanta Street around 4 a.m. Managers at the restaurant kicked the suspect out, following the fight, but police say the suspect stayed in the parking lot. ROSWELL, Ga. -- A women's health group in Fulton County said recent threats have forced it to drop ISIS from its name. ISIS Women's Health Care posted a message to its website saying that they had served expectant moms for the past 10 years. But that instead of raising banners to celebrate, they're taking down the ISIS moniker from their name. ROSWELL, Ga. -- Roswell Police are searching for the man who robbed a woman in her 90's. According to Roswell Police, the woman heard the doorbell ring three times just before 8:00 Sunday night. Moments later, there was a man standing in her bedroom. He forced her onto the bed at gunpoint then rummaged through her house, looking for cash and jewelry. The woman received minor injuries from the attack. Police believe the man entered the home on Wicklawn Way through an unlocked back door. He's described as a thin back male, about 5'11, 35-40 years old, wearing a dark hoodie zipped up to his chin. He was armed with a handgun. ROSWELL, Ga. – A woman attacked on a popular Roswell jogging trail is talking about the ordeal. The attack happened around 7 a.m. Sunday at Northshore Drive at Riverside Road. Melanie Watkins was training for a marathon when she said a man struck her in the back of the head. The jogger attacked while training on the Riverwalk Trail is trying to help police catch the man who left her bloody and bruised. Watkins said she hopes to resume training soon. "It's traumatic but I'll get over it and I'm going to be back out here as soon as my knee gets a little bit better,” she said. ROSWELL, Ga. – A 21-year-old man has died after being struck while riding a bicycle on a Georgia 400 exit ramp, according to police. Roswell Police say Cody Markel Dawson, of Johns Creek, was riding a bicycle south on the northbound exit ramp from Ga. 140 to Ga. 400 around 9:30 a.m. Saturday. Police said Dawson turned onto Ga. 400 and was struck by a bus. Dawson was taken to North Fulton Hospital, where he died Sunday afternoon. The bus was from Woodward Academy in College Park. Students were on the bus at the time of the crash, but none were injured. ATLANTA -- The Fulton County Medical Examiner has determined the cause and manner of death for Bobbi Kristina Brown. But the information won't be made public - at least not right away. The Fulton County Medical Examiner's office sent out a press release on Saturday. While it said the agency has determined the cause and manner of death, it won't be released to the public due to a court order from a Fulton County Superior Court judge. In it, the medical examiner is not to release any further information to the public. 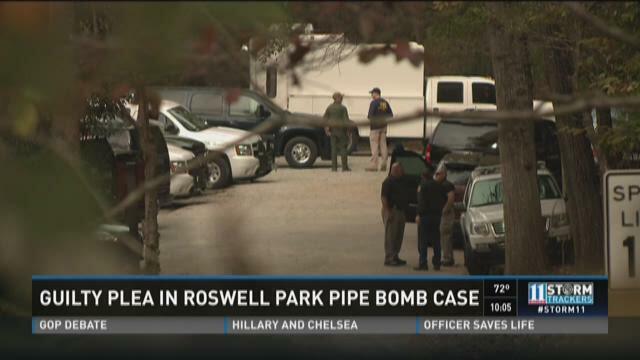 ATLANTA -- A Marietta man has pleaded guilty in United States District Court to placing a backpack containing pipe bombs in a National Recreation Area in Roswell last November. Assistant Unites States Attorney Kurt Erskine said Michael Conrade Sibley, 67, of Marietta pleaded guilty to placing the backpack in Vickery Creek Park on November 4, 2014. Two pipe bombs were inside the backpack. Sibley confessed he placed the backpack in the park in March, according to a Federal criminal complaint. ROSWELL, Ga. -- Usually, police have to chase suspects when they run from a crime scene. In Roswell, burglary suspects ran to the police department. Roswell Police spokesperson Lisa Holland said an officer on patrol heard an alarm coming from the Wender and Roberts Drug Store on Atlanta Street. The officer saw three men wearing gloves and masks running away from the business. He was able to arrest one of the men, but the two others ran away. Other officers set up a perimeter and called in a K-9 named Saar.